Three Sundays ago, I found myself in LaGuardia’s airport, awaiting a flight that would eventually land me in Fresno, California. Spring Break (still the dead of winter in these parts) started after the last class on Friday, and now I had a window of time in which to see my ninety-one-year-old Grandma—most likely for the last time on this earth. Half of New York (it seemed) filled the waiting areas as the weather was finally cooperating and flights were taking off on time. People who had been stuck for days in New York City because of the bad weather were finally going to their final destination. Not a good day for those trying to fly stand-by. I boarded my flight and endured the normal pre-flight instructions while the pilot pulled away from the gate. Then he stopped. “Well, folks, one of our auto-pilot controls isn’t working so we need to return to the gate and have a mechanic take a look. Should be only twenty or thirty minutes.” You know where this is going, right? Before I could fully comprehend all that was transpiring, I was on the flight, in my seat, waiting for take-off. The agent told me that the airlines would put me up in a hotel in Chicago and that I would fly the next morning to LA and then onto Fresno. I didn’t have any boarding passes or specific details at this point, but the kind agent assured me she would take care of them while I was in the air. So with a spirit of trust and a quick prayer, I sunk into my seat and breathed a sigh of relief. O’Hare was much quieter than LGA. In a matter of ten minutes (not counting the two minutes with a rude agent who told me she didn’t have time for “complicated”), I had a voucher for a hotel and two meals, and an e-ticket for the rest of my flight. Suddenly, my travel “luck” seemed to be turning. When I arrived at the hotel shuttle area, the bus for the Hyatt was waiting. Checking into the hotel was a dream. The polite hotel receptionist made me feel like I was a frequent guest. Too bad my stay would be so short. My flight for LA left at 7:25 am the next day so to bed I was headed. Even though I was enormously grateful for this new set of plans, I was disappointed that I would not see my friend, Margaret. Originally, I was set to spend Sunday night at her house. At some point in the night, my sleep was interrupted by the sound of loud laughter and cheering. I rolled over in bed, expecting the noise to die down as I assumed some late-night partiers were headed to their rooms. The noise and laughter continued. And continued. What was going on? I wasn’t at the Motel 6, after all! The noise continued even after my early morning alarm went off. As I made my way to coffee shop for my morning cup of joe, my eyes took in the scene—multiple police cars, several individuals in handcuffs, and one man holding an ice pack to his eye. The coffee shop worker was in the know. The hotel rented out its large ballroom to Salsa Dancers and I guess the party went south at some point. Fellow travelers joined me in the lobby as we waited for the shuttle. We compared notes about our night’s sleep and Salsa Dancers. I am happy to report that the rest of my trip unfolded as planned. I found another reason to love early morning travel too. If a snow storm is expected to hit the area in which you plan to leave, an early flight has a better chance of making it out or arriving. Later that day, O’Hare cancelled hundreds of flights due to snow. 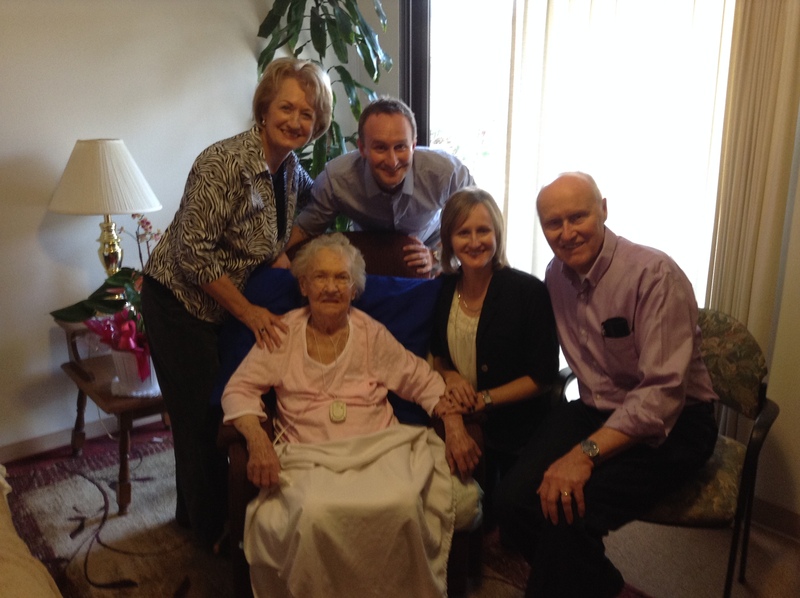 Travel challenges and adventures notwithstanding, the purpose of my trip was to see my Grandma. At several points in the weeks leading up to Spring Break, it seemed as if Grandma would certainly pass. My parents flew to be with her and shared updates that didn’t look good. Yet, Grandma held on. She even “recovered” to a certain extent. I wavered—should I go or not? I am glad I went and for the encouragement from many who told me I should go. Grandma certainly wasn’t up for lots of chit-chat; yet, even in her weakened state, glimpses of the Grandma I know and love were evident. The crack of a joke, the roll of an eye, the familiar smile, the care about her appearance, were all reminders of the person she is. My brother also flew to California to see Grandma, and along with my parents, we enjoyed some meaningful time with extended family. Who can fully understand the dying process? By the world’s standards, my Grandma is unproductive. She can’t “do” much. She can barely feed herself. She wonders why the Lord still has her on this earth. She is ready to go home. I don’t have answers to these questions, but I trust God’s sovereignty and timing. As I said my goodbyes to Grandma, she told me, “The Lord has his reasons.” Yes, he does. Those of us on this side of eternity may never know those reasons. Why does one person linger and another go in an instant? These are the unanswerable questions of life. Grandma’s time on this earth will draw to a close soon. Yes, there will be tears, but I take comfort in the fact that she will be fully restored in an instant. The energetic, playful, smart woman will be the whole woman she has imagined herself to be even in these late years of life. I had one hiccup on my return flight home that turned out to be another grace. My flight leaving Fresno was delayed, which meant I missed my connection in San Francisco. The ticket agent rebooked me on a non-stop flight from San Francisco to JFK. I sat in business class and enjoyed additional amenities—a blanket, a pillow, and free movies, plus arriving home an hour earlier. Little did I know that a few days later more travel mishaps awaited. But that is another story for another post.